If I had to list the hobbies that are the most fun for me to do, dog training would be right up there near, if not at, the top. If you stop to think about it, there are many fun activities you can take part in with your four legged furry friend. As well basic training, there are tricks, agility, scenting (a personal favourite), treibball and many others. Some of these are available through The Friendly Dog Club and during the summer months there are classes for people and their dogs to try out agility and gun dog skills. It was the latter of these that I thought would be fun to have a go at. Let me, at this point, introduce myself. I’m Andy Clayton and have been bringing my dogs to the Friendly Dog Club for over a decade. I have two English Cocker Spaniels and one of them, Amber, really enjoys scent work and general training and basically anything that will result in her getting a biscuit. She’s very focussed and really enjoys being on the go (although when she’s not she’s extremely adept at sleeping under my desk). I will be writing a few posts over the summer about our first steps in to gun dog training. We turned up at the first session with a mixture of excitement and trepidation! I wondered how Amber would react to dogs and people she’s never met before. Neither of us have ever done any gun dog work at all so we really didn’t know what to expect. The sessions are being run by The Friendly Dog Club’s Gemma Cox who is an experienced gun dog handler. She knows her stuff and so I went to the class determined to listen carefully to what we were being told to do. That can be difficult with Amber, as she’s so keen to work (for “work” read “do something to get a biscuit, or preferably lots of biscuits”) that she has this habit of squeaking when she’s sitting still. It’s quite embarrassing when on holiday as standers by think I’m doing something terrible to this cute cocker spaniel when in actual fact I’m just trying to pretend that the noise she’s making is perfectly normal. “There’s nothing at all to worry about here, move along please”. 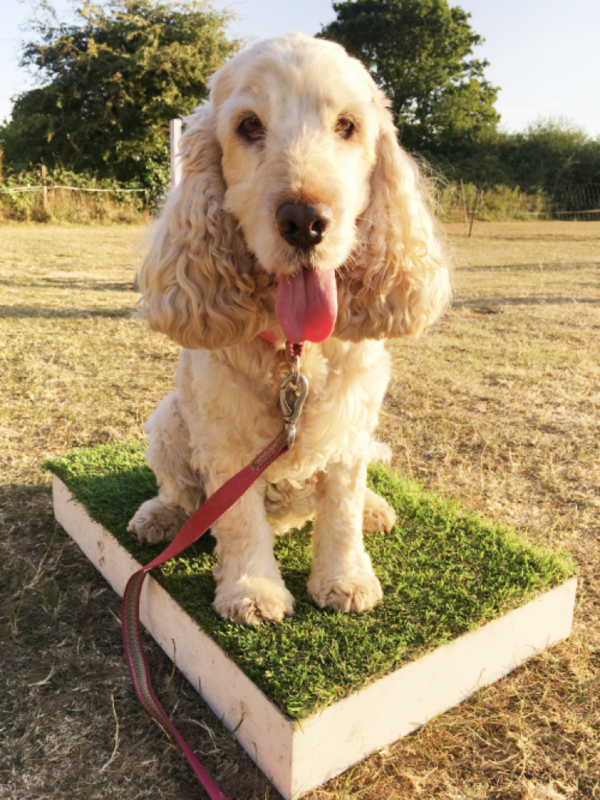 In this first class I was in luck as the tasks we were required to do involved a good dollop of basic training skills such as walking to heel, sit and stay (with distractions), sit on a mat (it wasn’t a mat but we’ll talk more about that in minute). Amber is old enough to have learned these skills however with the distractions of other dogs I was delighted to see that she stayed focussed on me and performed with aplomb (“engage proud dad mode”). I must say at this point that Amber is 8-years old and some of the other dogs on the course are much younger than her and would probably be more easily distracted. If you ever attend a class and feel that your dog isn’t doing what you want him or her to do, then don’t be down hearted. Amber appeared to be performing well, however it’s taken many hours of patient effort to get to that stage. It took a long time for her to understand that I wanted her to “sit on a mat” or “walk to heel”. At times I felt she’d never get it. Patience is key here. And biscuits. Don’t forget the biscuits. Training your dog to sit still whilst there are distractions around them is something that you will do in normal training classes, however asking them to sit in a field while people are flinging their arms about and generally looking like an idiot is something any dog could struggle to master. And so it was with Amber. I could leave her in a sit wait and then walk away and she was fine. Do something daft (I’m really good at that) and she stood or started walking towards me. After a few attempts, she started to grasp the fact that I wanted her to stay put whatever idiotic stance I was enthusiastically throwing myself in to. This will clearly need further practice, however I was pleased with how she did at this, even if I wasn’t as pleased with my terrible "Dad dancing"-esque distraction techniques. One particular aspect of gun dog training that is almost completely new to Amber is the use of a whistle. I’ve used one sparingly to get her to return to me if she ventures off, but no more than that and, to be honest, it doesn’t usually invoke an immediate response from her. This will prove to be one of the biggest challenges for us on the course. We also used the whistle for the recall from quite a long distance. All the dogs on the course did this well. I’d love to get to the stage where Amber returns immediately as soon as she hears my “peep, peep, peep”. Gemma demonstrated this with her dogs and it was most impressive! Something to aim for over the coming weeks and months. We were introduced to “place boards”. I’d never come across these before, but as soon as she got within a couple of paces of one, Amber jumped on a board and looked at me for one of those magic biscuits. She saw it as a “mat” when it’s actually a board covered with artificial grass (they’re all a standard size, apparently). Anyone watching would’ve been forgiven for thinking that Amber is a natural at this, however it goes back to what I said earlier. It took months to get her to grasp sitting on a mat. Back in those difficult days when I didn’t think she’d ever get it, Angela Horsley once said to me that one day the penny will drop and then she’ll sit on a mat whenever she sees one. And that’s exactly what happened, as was ably demonstrated at the first gun dog class. This first session was huge fun. Both Amber and I loved it. Any sort of training is brilliant, and if you have the help and support of knowledgeable trainers, like those at The Friendly Dog Club, then when you inevitably come across areas where you and/or your dog struggle, they will have useful tips to help you move forward. As I look lovingly at a very tired out Amber snoring loudly by my feet, I remember that in dog training all you need is patience. Oh and biscuits. Lots of biscuits.